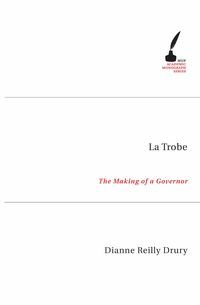 Dianne Reilly Drury is La Trobe Librarian at the State Library of Victoria and has worked at both the Bibliotheque Nationale and the Centre Pompidou Library in Paris. A graduate of the University of Melbourne and Monash University, her previous published works include Sun Pictures of Victoria: the Fauchery-Daintree Collection, 1858 with Jennifer Carew (1983), and Charles Joseph La Trobe: Landscapes and Sketches (1999). She is currently Secretary of the C J La Trobe Society.